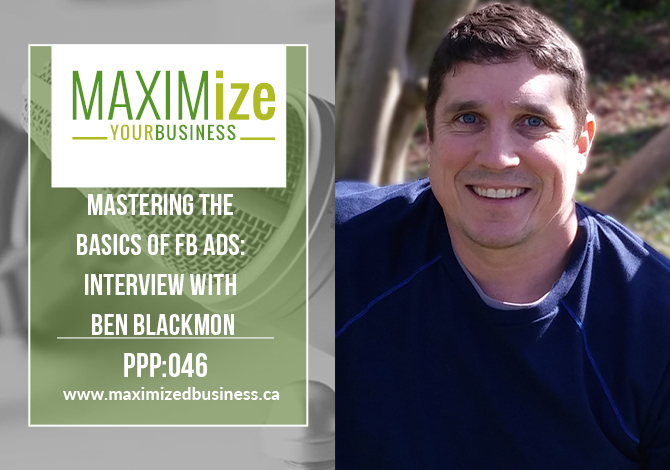 Ben Blackmon is a Kentucky-based Facebook Ad Manager, husband, and father of 2 who is dedicated to helping people review their current marketing efforts, and guiding them to success they can follow to allow them to spend more time working on what they’d rather be doing. This episode is one that is long overdue. This was something I knew I need to create a show about Facebook Ads. More people are starting to do Facebook Live videos as well as purchase ads, but one thing that is holding so many of us up is the simple question: how do we use Facebook Ads to our advantage? I’m now at the point where I know how to set everything up, what the expectations are in relation to letting the Facebook algorithms do their things. In this episode, I’ll be sharing that information with you. Today I’m talking to Ben Blackmon. He is a facebook ad manager and actually for my last 5 Day Lead Magnet Challenge, I used him as someone to help me run my Facebook Ads. When I launched the Maximized Your Clinic Course for the first time I outsourced the work to someone from Upwork. He ran the ads for the month of July and it cost about $700. Overall, my cost per lead was much high because I was adding in his hourly wages into the price of the Facebook Ads themselves. I wanted to learn how to utilize Facebook Ads myself, but I was having a lot of trouble understanding them, which is what led me to get in touch with Ben. If you are really curious about Facebook Ads and you want to learn more about how to set it up, the right way to do it, what the exact ad spend should be, when you should start, and how long it takes to get traction. The sponsor of this episode is my 7 Day Detox Program. I created this with you guys in mind, to give you a completely free program that allows you to set up an in-office and online program that you can set up and start selling to your patients. When did the transition to using Facebook ads to gain customers, make sales, etc. really start? What is it about Facebook ads that draw people to use it opposed to Google ads per say? Is it possible for Facebook ads to be used for local business owners to attract local customers to my practice? If I’m trying to target my audience, how do I use Facebook to reach those people? How do I know who to target and what to look for? What Ben’s most successful funnel, that actually converts is. How to make sure potential customers see your ad. Ben’s suggestion to targeting the biggest audience using Facebook ads. The tools Ben prefers to analyze and assess Facebook ads.